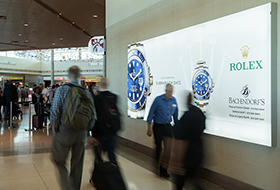 Baton Rouge, LA – August 8, 2017 - Lamar Advertising Company (Nasdaq: LAMR), a leading owner and operator of outdoor advertising and logo sign displays, announces the Company’s operating results for the second quarter ended June 30, 2017. Lamar reported net revenues of $397.1 million for the second quarter of 2017 versus $387.5 million for the second quarter of 2016, a 2.5% increase. Operating income for the second quarter of 2017 increased $11.1 million to $128.2 million as compared to $117.1 million for the same period in 2016. Lamar recognized net income of $92.4 million for the second quarter of 2017 compared to net income of $81.9 million for same period in 2016. Net income per diluted share increased 11.9% to $0.94 from $0.84 for the three months ended June 30, 2017 and 2016, respectively. Adjusted EBITDA for the second quarter of 2017 was $181.9 million versus $176.4 million for the second quarter of 2016, an increase of 3.1%. Cash flow provided by operating activities was $160.3 million for the three months ended June 30, 2017, an increase of $0.8 million as compared to the same period in 2016. Free cash flow for the second quarter of 2017 was $119.2 million as compared to $112.1 million for the same period in 2016, a 6.3% increase. For the second quarter of 2017, Funds From Operations, or FFO, was $140.9 million versus $130.2 million for the same period in 2016, an increase of 8.2%. Adjusted Funds From Operations, or AFFO, for the second quarter of 2017 was $136.5 million compared to $133.7 million for the same period in 2016, an increase of 2.1%. Diluted AFFO per share increased 1.5% to $1.39 for the three months ended June 30, 2017 as compared to $1.37 for the same period in 2016. Acquisition-adjusted net revenue for the second quarter of 2017 increased 1.7% over Acquisition-adjusted net revenue for the second quarter of 2016. Acquisition-adjusted EBITDA for the second quarter of 2017 increased 2.4% as compared to Acquisition-adjusted EBITDA for the second quarter of 2016. Acquisition-adjusted net revenue and Acquisition-adjusted EBITDA include adjustments to the 2016 period for acquisitions and divestitures for the same time frame as actually owned in the 2017 period. See “Reconciliation of Reported Basis to Acquisition-Adjusted Results”, which provides reconciliations to GAAP for Acquisition-adjusted measures. 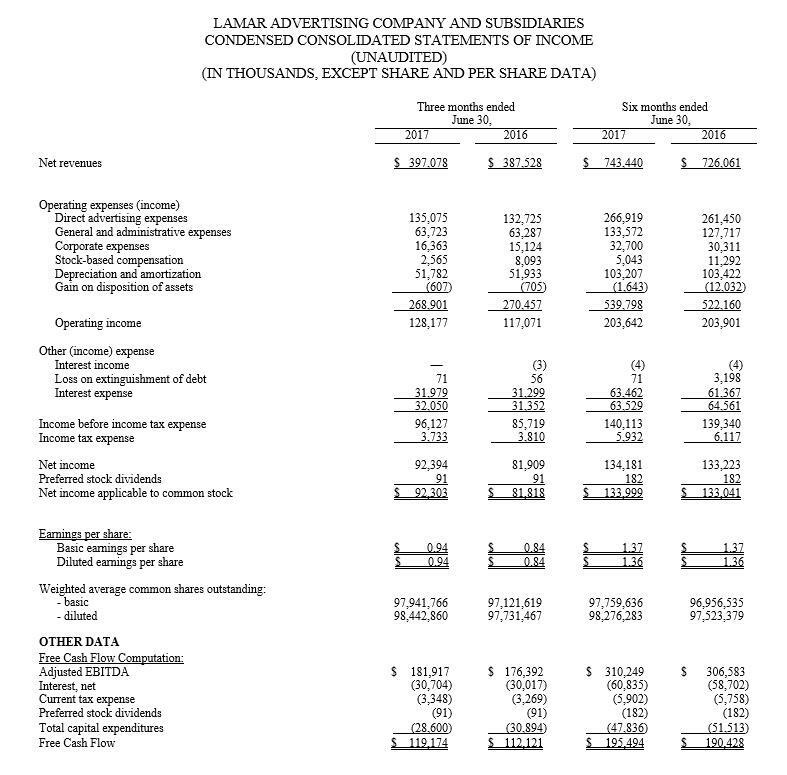 Lamar reported net revenues of $743.4 million for the six months ended June 30, 2017 versus $726.1 million for the same period in 2016, a 2.4% increase. Operating income for the six months ended June 30, 2017 was $203.6 million as compared to $203.9 million for the same period in 2016. Lamar recognized net income of $134.2 million for the six months ended June 30, 2017 as compared to net income of $133.2 million for the same period in 2016. Net income per diluted share remained unchanged at $1.36 for the six months ended June 30, 2017 and 2016. 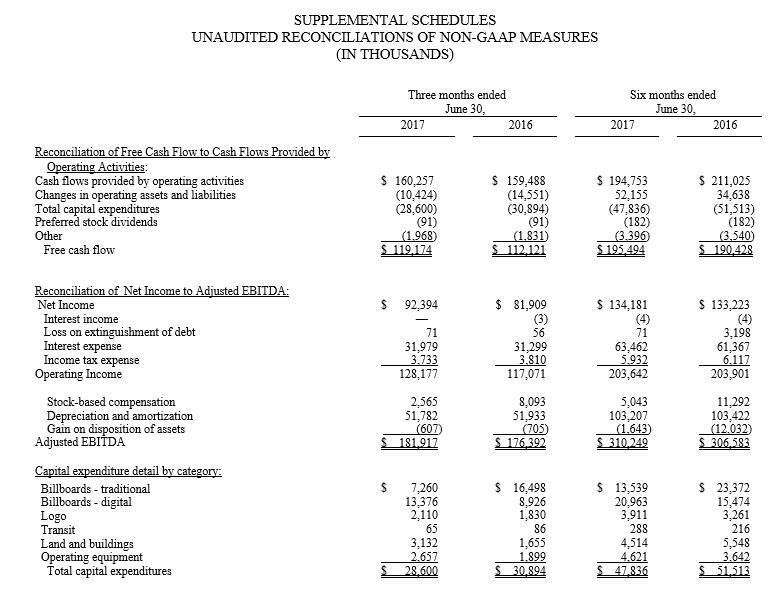 In addition, Adjusted EBITDA for the six months ended June 30, 2017 was $310.2 million versus $306.6 million for the same period in 2016, a 1.2% increase. As of June 30, 2017, Lamar had $452.8 million in total liquidity that consisted of $409.9 million available for borrowing under its revolving senior credit facility and approximately $42.9 million in cash and cash equivalents. Due to current market conditions, the Company is revising its 2017 full year guidance for Earnings per share and AFFO per share. Net income per diluted share is expected to be between $3.09 and $3.19. 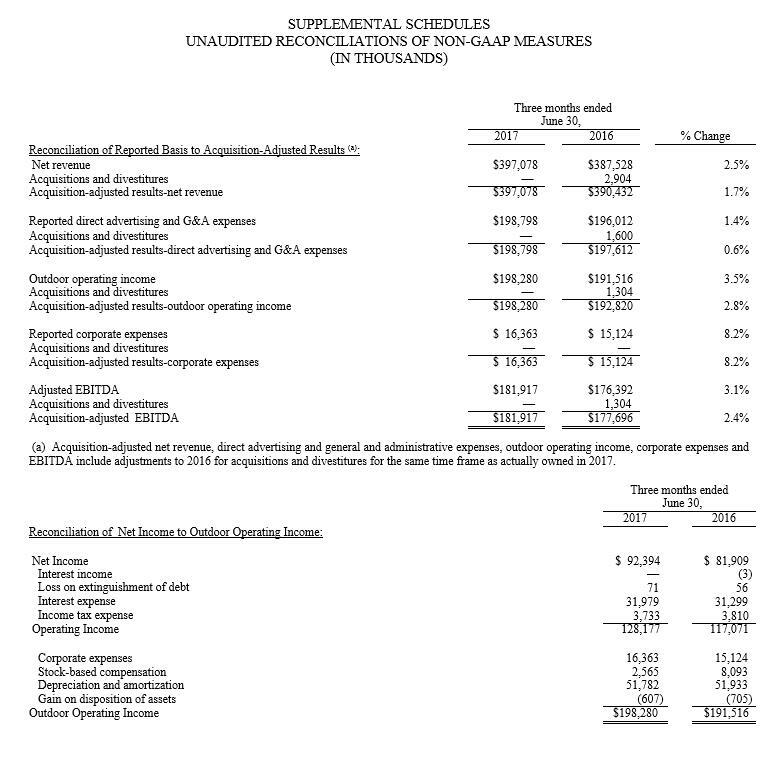 Previous Diluted earnings per share guidance had been $3.13 to $3.28 per share. 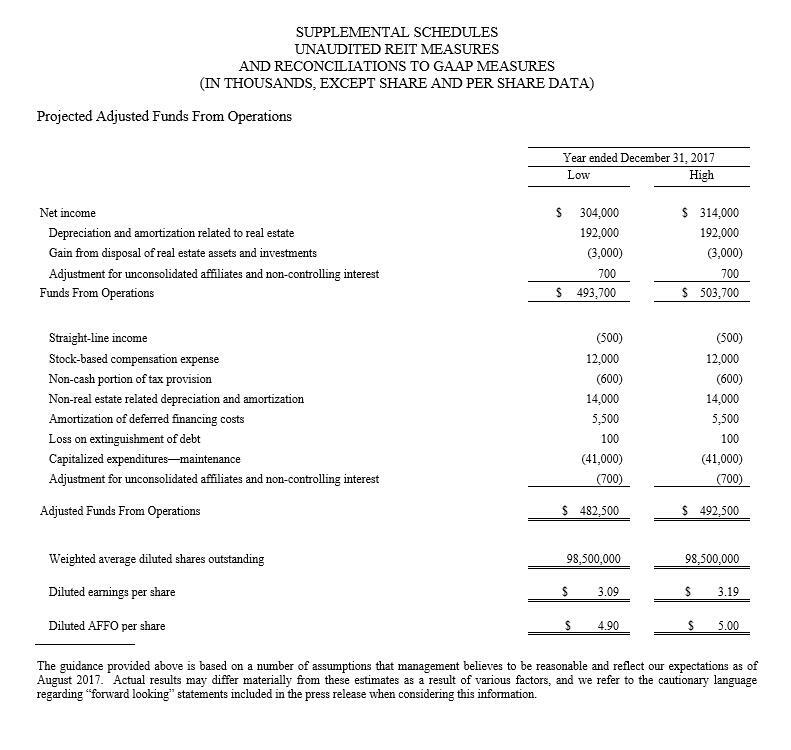 In addition, Lamar expects Diluted AFFO per share for 2017 to be between $4.90 and $5.00. Previous AFFO per share guidance had been $5.05 to $5.20 per share. See “Supplemental Schedules Unaudited REIT Measures and Reconciliations to GAAP Measures”, for a reconciliation to GAAP. Lamar Advertising Company today announced that it has acquired the assets of Steen Outdoor Advertising, significantly enhancing Lamar’s position in Philadelphia and the surrounding region.